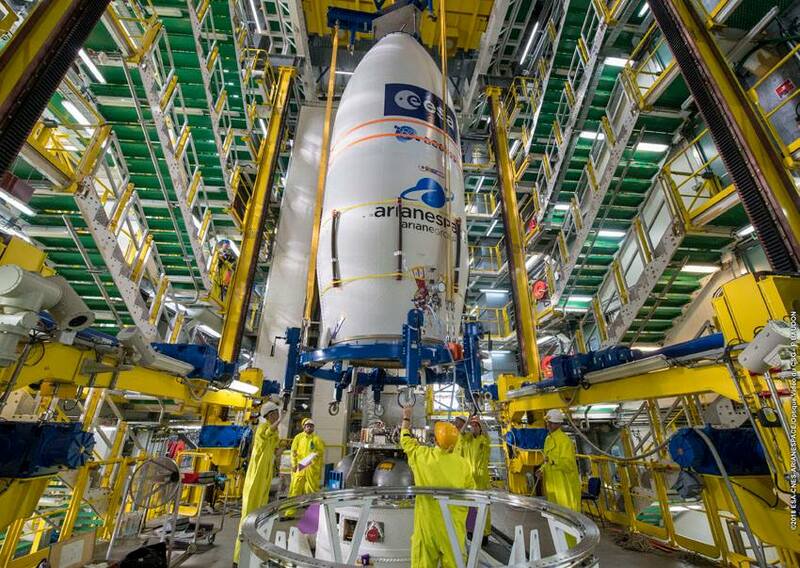 The liftoff of a European satellite to measure global wind fields has been delayed 24 hours to Wednesday in hopes of a better weather forecast at the Vega rocket’s launch base in French Guiana, officials announced Monday. The European Space Agency’s Aeolus satellite is ready for launch aboard a solid-fueled Vega rocket, the smallest booster in Arianespace’s fleet, to begin a three-year science mission to monitor wind speeds in Earth’s atmosphere. 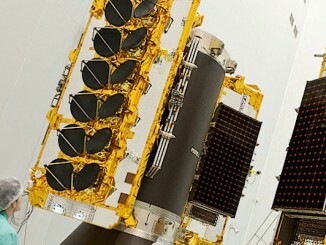 Officials from Arianespace, ESA and CNES — the French space agency — convened Monday for a launch readiness review. Managers confirmed the readiness of the four-stage Vega launcher and the Aeolus spacecraft, but unfavorable high-altitude winds predicted during at Tuesday’s launch time prompted a 24-hour delay. 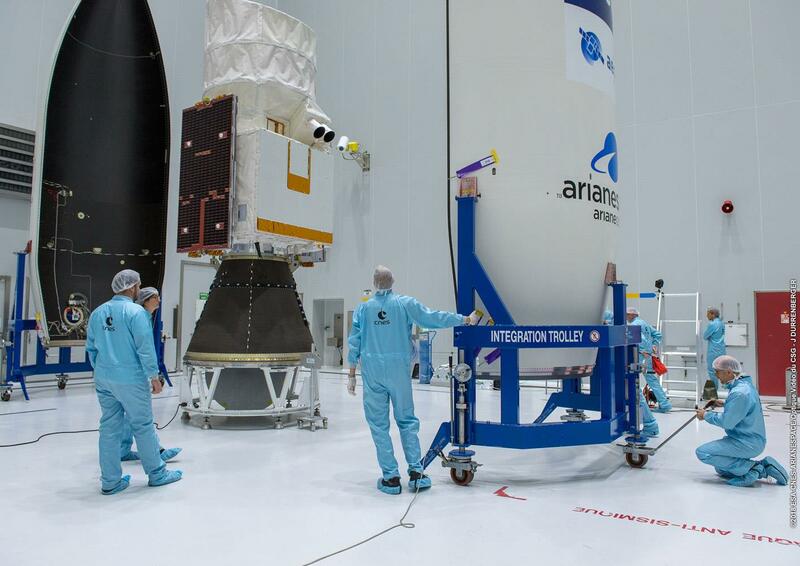 Liftoff of the Aeolus mission is now scheduled for Wednesday at an instantaneous launch opportunity set for 2120:09 GMT (5:20:09 p.m. EDT; 6:20:09 p.m. French Guiana time), assuming the upper level wind conditions improve. “Wind conditions in the atmosphere along the launcher’s trajectory are among the flight safety elements taken into account for every Arianespace mission,” Arianespace said in a statement Monday. 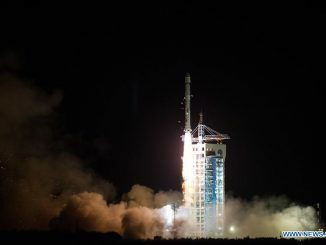 Officials familiar with Vega launch operations said the upper level winds violated safety limits established to ensure debris from an in-flight mishap will fall away from populated areas. The irony of the Aeolus mission’s launch delay due to winds was highlighted on an official ESA Twitter account. After liftoff, the Vega rocket will fly to the north from the spaceport in Kourou, French Guiana, to release Aeolus in a 199-mile-high (300-kilometer) polar orbit. Built by Airbus Defense and Space, the satellite will fly in an unusually low orbit for a science mission, placing the observatory closer to the winds it will measure in Earth’s atmosphere. 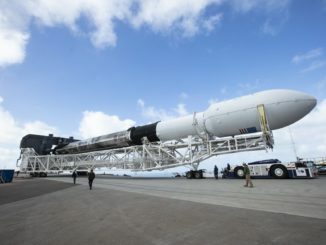 Aeolus weighs approximately 3,000 pounds — exactly 1,367 kilograms, according to ESA’s project manager for the mission — fully fueled for its liftoff from the Guiana Space Center on the northeastern coast of South America. Aeolus carries a high-power ultraviolet Earth-pointing laser to allow the mission to measure the movement of air molecules in the atmosphere. Scientists designed the mission to detect wind speeds at various levels of the atmosphere, ranging from the surface to an altitude of nearly 100,000 feet (30 kilometers). Named for a figure in Greek mythology who was appointed by the gods as “keeper of the winds,” the Aeolus mission cost around 480 million euros — nearly $550 million at today’s exchange rates — to design, develop and prepare for launch. The development of Aeolus also stretched over 16 years, a decade longer than originally planned. No other space mission has been able to measure winds at multiple layers of the atmosphere on a global scale. Previous satellites have been limited to deriving winds measurements by tracking the movement of clouds and aerosols, or by measuring the effect of winds on the ocean surface. If scientists can prove the reliability of Aeolus data after launch, meteorologists plan to incorporate the information into global weather prediction models. The new wind input could result in more accurate forecasts, officials said.